A crater immediately to the east of Biblis Patera. Some questions include: (a) what is the “deposit” on the west side of the crater, seeming to cover the wall/floor interface? (b) what is the floor material; did lava come up into this crater? 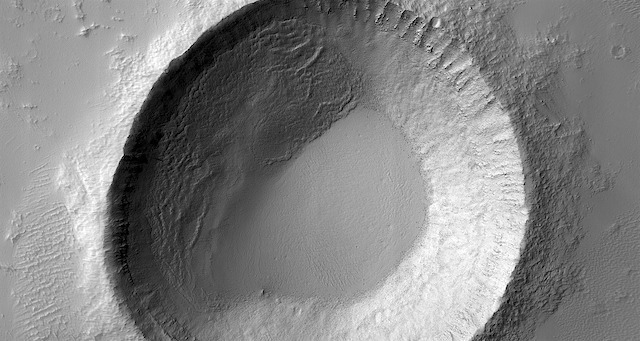 The “deposit” might be taken by some to bear resemblance to materials sometimes interpreted as ice-related… but this is an equatorial crater. This entry was posted in Reports and tagged Beautiful Mars, Biblis Patera, ground ice, High Resolution Imaging Science Experiment, HiRISE, landslides, Mars Reconnaissance Orbiter, MRO, NASA, periglacial processes, University of Arizona. Bookmark the permalink.